This patent is for "new and useful improvements in roofs." The patent was awarded July 24, 1888. There's no doubt that Haish's carpentry skills were useful while putting together this application. 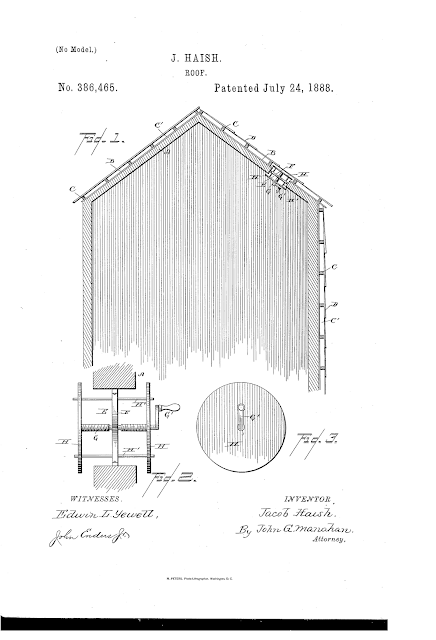 "My invention has reference to improvements in roofs; and it consists in a novel construction whereby the air is permitted to circulate under the shingles or outer coating for the purpose of preserving the material, and also to afford means of readily ventilating the interior of the building through the stratum of air between the exterior coating and the interior portion of the roof or side, which stratum, being largely stationary, has the effect also, as a [nonconductor] of heat, of [aiding] to the warmth of the roof or wall so far as relates to retaining the heat which may be within the building, but at the same time excluding from the interior any intense exterior heat, thus rendering the building warmer in cool weather and cooler in warm weather."